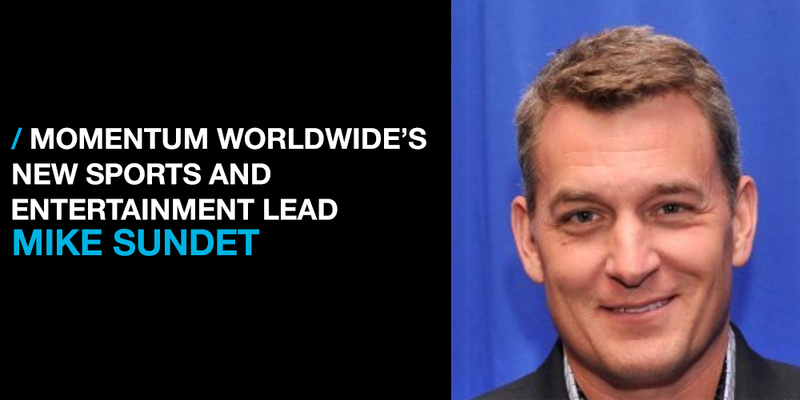 ST. LOUIS – February 26, 2015 – Mike Sundet, previously of Anheuser-Busch InBev, joins brand experience and sponsorship marketing agency Momentum Worldwide as SVP, Director of Sports and Entertainment. Starting March 16, Sundet leads Momentum’s newly aligned sports and entertainment disciplines, building innovative, creative work for a client roster including American Express, Coca-Cola, United Airlines, U.S. Army, Mondelēz International, and more. Based in St. Louis, Sundet will report to EVP, Regional Director NA, Donnalyn Smith. Sundet was most recently VP, Sports & Entertainment Marketing and Advertising Services at Anheuser-Busch InBev – a role he’s held since 2013 where he oversaw nearly $100 million in sponsorships and advertising budgets across more than 50 sports and entertainment properties. For the 2015 Super Bowl, he oversaw the activation of the Bud Light House of Whatever. He led multiple brands for the leading global brewer, identifying and negotiating deals with sports properties and partners alike. Under his leadership, Budweiser was named SportsBusiness Journal’s “Sports Marketer of the Year” in 2013. Prior, as Vice President, Bud Light Marketing, he led the brand’s overall experience including overseeing the national rollout of Bud Light Lime Straw-Ber-Rita (2013) and Lime-A-Rita (2012), including all advertising, media, and promotional elements; both brands were named the top beverage launch of the year by market measurement agency IRI. For the 2010 Super Bowl in Miami, Sundet created and oversaw the activation of the Bud Light Hotel that has since become a key component of Bud Light’s annual Super Bowl marketing program. Sundet spent nearly 20 years at Anheuser-Busch InBev.